From the Division of Medicine (J.M.N.F. ), Singapore Health Services; and Department of Neurology (G.J.N. and N.C.K.T. ), National Neuroscience Institute, Singapore. 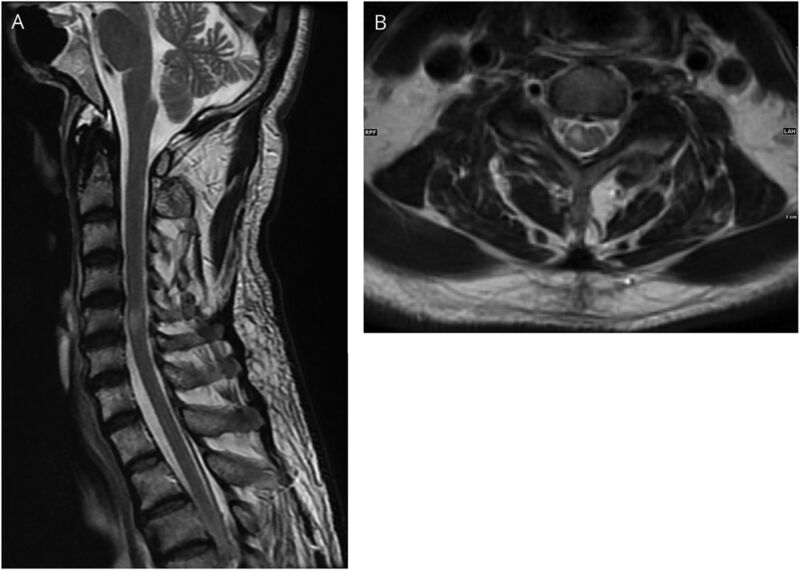 A 59-year-old man with a history of smoking presented with acute right hemiparesis, pain, and temperature loss on the left below T4 and impaired left-sided abdominal reflexes. Proprioception and vibration were normal. MRI (day 3) showed a short segment of T2 hyperintensity at the right half of C5 spinal cord (figure 1); diffusion-weighted MRI (day 5) demonstrated restricted diffusion (figure 2), confirming hemicord infarct. Sulcal artery occlusion presents with incomplete Brown-Sequard syndrome and is uncommon, unlike the more common anterior spinal artery syndrome.1 It preferentially involves the cervical cord.2 With physiotherapy, aspirin, and statins, this patient recovered well. T2-weighted MRI sequence (day 3), sagittal (A) and axial (B) sections. Diffusion-weighted MRI sequence (day 5), diffusion-weighted sagittal (A) and axial (C) and apparent diffusion coefficient sagittal (B) and axial (D) sections. J.M.N. Fong: writing of manuscript. G.J. Ng: writing of manuscript. N.C.K. Tan: study concept and design, critical revision of manuscript. J.M.N. Fong and G.J. Ng report no disclosures relevant to the manuscript. N.C.K. Tan owns stock in Novartis, Pfizer, and Johnson & Johnson. Go to Neurology.org/N for full disclosures. The authors thank Dr. Yu Wai-Yung (National Neuroscience Institute) for providing the MRI.
. Vascular myelopathies. 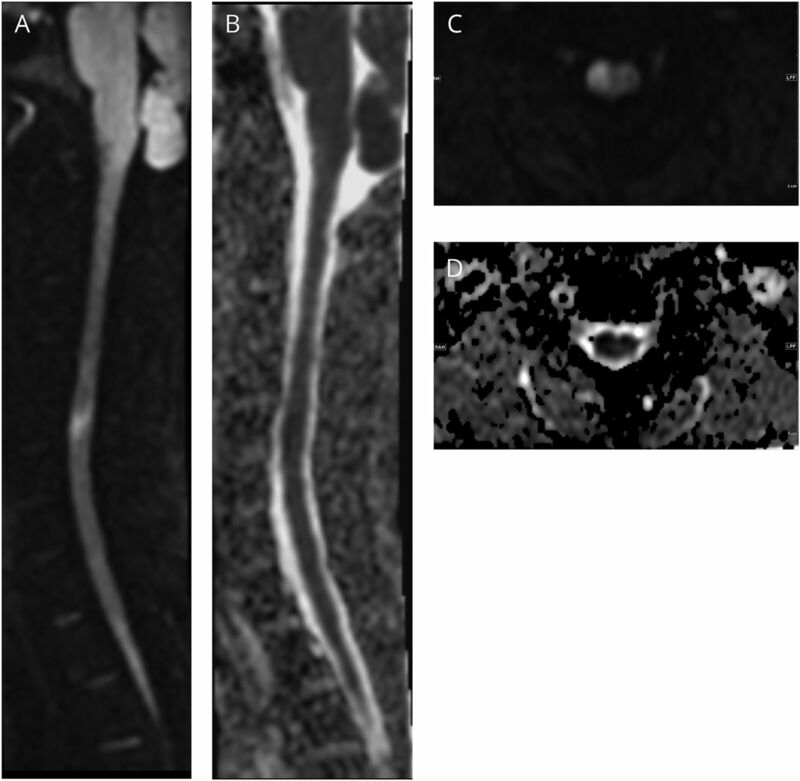 Continuum 2015;21:67–83.
. Spinal cord ischemia: aetiology, clinical syndromes and imaging features. Neuroradiology 2015;57:241–257.